Good size for a 23 litre (40 pint) brew length and it fits on most domestic hobs. 35cm x 35 cm high. 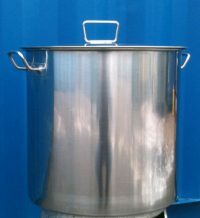 Purchase this product as a 33 litre stainless pot. Good size for a 23 litre (40 pint) brew length and it fits on most domestic hobs. 35cm x 35 cm high. 40mm hole cut into the pot, suitable for a kettle element.